Apple's iOS 7 was a major departure from previous versions of its mobile operating system, bringing a simpler and cleaner look to the software. The new update builds on some of the new designs concepts, while also allowing users to disable some of the new features that had drawn criticism such as the software's parallax and zoom functions. The update is available from today. Apple will be pushing it out to users over the next few days, but users can go get the new version by going to Settings; General ; Software Update. The new update promises to be more stable, fixing some of the bugs that caused the iPhone and iPad to randomly crash and reboot--an annoyance dubbed the 'white screen of death.' This was the biggest complaint of iOS 7 users. One of the flagship features of Apple's iPhone 5S, which debuted running iOS 7, is the fingerprint sensor. The performance of Touch ID has been spotty for some users and a source of frustration. The update aims to address that by improving how the Touch ID adapts over time. Some users had complained that the performance of Touch ID seemed to fade over time. Apple promises that the update will make Touch ID work faster. The new look of iOS 7 reflects the sensibilities of Apple's design head, Jonathan Ive, who oversaw the software's revamp. In the update, there are more design changes. For example, the green and red icons for answering or declining a phone call are now round instead of square. There are also more colors and greater color contrast to help icons stand out more against the software's translucent background. Apple has included high dynamic range, or HDR, in its mobile software for years, but we may see more people using it. HDR promises to create a better-lit image because it blends the exposure data from three different images--although it can cause a blurry picture if the photographer moves too quickly after taking the photo. One of the most interesting new features of the update is something that we'll have to wait to use. The latest software is compatible with CarPlay, Apple's new initiative to bring iPhone features such as maps, music and messages to the in-car display. However, no cars currently on the market work with CarPlay. Apple has said CarPlay will be available in certain cars later this year from Ferrari, Mercedes Benz, Volvo, Honda and Hyundai, with additional car makers following in the years to come. 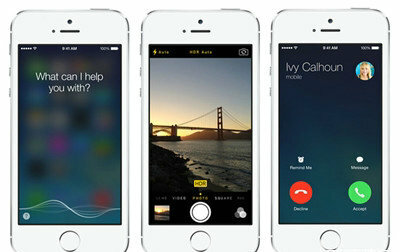 Other improvements include making iOS 7 faster for iPhone 4 users, a new bold font option for the keyboard, a month-at-a-glance view in the calendar and new voices for Siri in British and Australian English, Mandarin and Japanese.